A perfect run to the championship game versus Stanstead College had the varsity Saints poised for their first national title since 2016, locked in a battle of the prestigious tournament’s only remaining undefeated teams. The Saints seemed to have the reins to the game in the second period, scoring three straight goals off a pair from Matthew Steinburg and a single from Devlin Obrien to take a 3 – 0 lead. Saints goalkeeper Dante Fernandes held Stanstead off the scoresheet until close to midway through the first period, though Obrien’s second of the game was the only thing holding back a Stanstead comeback in the Saints squeaking out a 4 – 3 victory to take the national title. Prior to the third period shakeup, Fernandes and the Saints dominated their competition defensively in allowing only three goals in the previous four games of the tournament, including a 5 – 0 shellacking of the rival Upper Canada College in the semifinal matchup. Fernandes needed to make just fifteen saves in the contest, a rivalry over a century old. Christian MacDougall led the way with a pair of goals, while adding an assist. 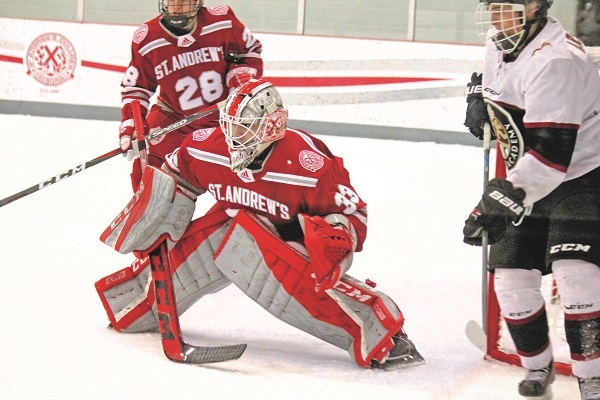 It was a fitting end to what has been a near-perfect season for the varsity Saints, completing their own version of the Holy Trifecta with championships in January’s MacPherson tournament, the CISAA title, and now the NISIC title. The Saints entered and completed the tournament as the top-ranked team in the country by MyHockey rankings.